As a weaver, I was deeply humbled by the woven fabrics in the exhibition, Art of the Zo: Textiles from Myanmar, India, and Bangladesh at the Philadelphia Museum of Art. All of them woven on simple backstop looms. From small beads on the selvedges to tiny decorative stitches that decorate seams, the textiles show not only the technical expertise of the weavers, but their sophistication in color and design. I was captivated by the tunics, wrap skirts, mantles, loincloths, capes, and blankets and for the range of decorative techniques ranging from unpatterned indigo-dyed cloth to colorful stripes to complex weaves and thought you might enjoy them, too. But this is just a taste. There are many, many more in the exhibition. The Mara woman's mantle, at top right, is described as a cotton warp-faced plain weave with discontinuous two-faced complementary weft patterning and countered weft twining. 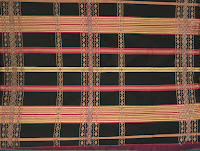 Woven by a Christian woman in India, Mizoram, Zawngling Village in 1983, it was worn to a christening. The mantle at right is a Tashon man's ceremonial mantle woven about 1960 in Myanmar. It is cotton warp-faced plain weave with discontinuous one-faced supplementary weft patterning. Look carefully at the small decorative horizontal stripe mid-way down. It seams together the long sides of the rectangular mantle and complements the design. Below, the Mizo woman's ceremonial jacket, c. 1970-80, and ceremonial wrapped skirt, c. 1950-70, are typical of celebratory and funerary dress for married women in Myanmar, Northern Chin State or India. Both the jacket and the skirt are woven of cotton woven in a warp-faced plain weave, but they differ in technique and patterning. 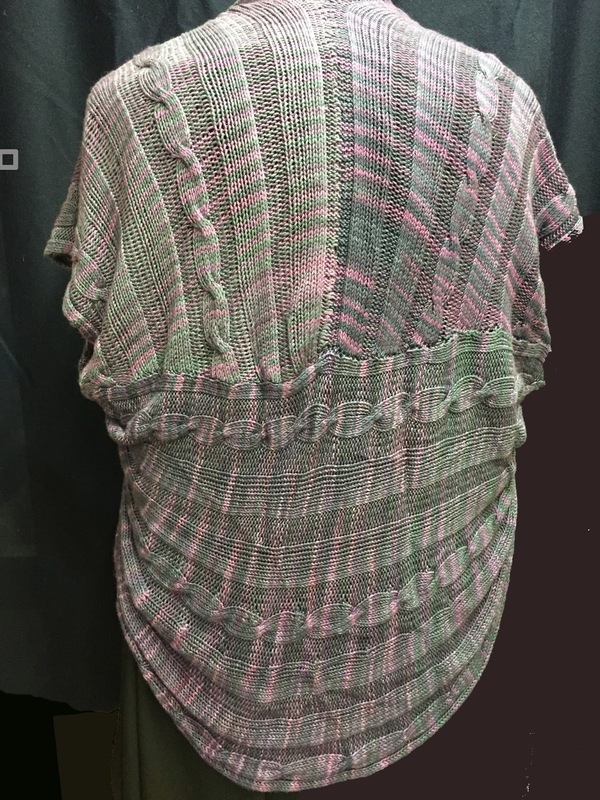 The jacket woven structures include continuous one-face supplementary weft patterning and and discontinuous one-faced supplementary weft patterning. The skirt features discontinuous two-faced supplementary patterning, tapestry, weft-faced plain weave and red weft. Comprised of three lengths of cloth,it can also be worn as a mantle. Khamau woman's tunic, c. 1900. The Khamau woman's tunic, c. 1900, at right was a particular favorite. 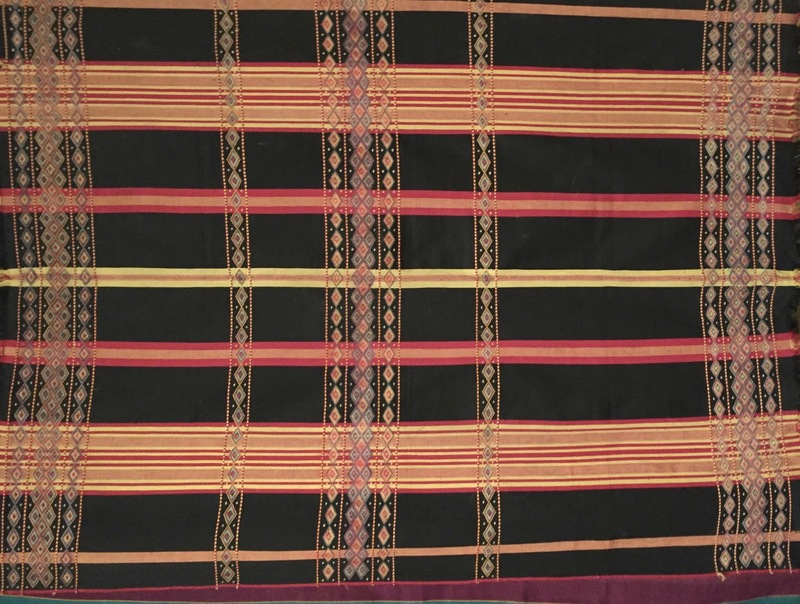 According to the signage, the Khama (Myanmar) are the only Zo people known to decorate their textiles with resist dyeing. Unfortunately, there have been few garments made in this tradition in the last 80 years. This exhibit, which includes items from the Museum’s collection of Zo textiles as well as loans from Barbara and David Fraser, authors of Mantles of Merit: Chin Textiles from Myanmar, India, and Bangladesh (2005), is well worth a visit for anyone interested in textiles. The exhibit is in the Perelman Building of the Philadelphia Museum of Art and runs to March 20, 2016. Thank you, Suzanne Jenkins, for the comment to a recent blog. It caused me to examine why I do what I do. In this case, the 'why' focused on knitting, but the question applies all creative endeavors, including fiber arts. The "process vs. project" theory divides fiber artists, which seem to be applied mostly to knitters, into two camps. Process people prefer the time spent exploring and learning the craft. Project people prefer working to an end result. Plenty of knitters seem to like the designation as there are a number of blogs and comments on the topic. At least one extends the label to a 'pre-process' stage that addresses the love of planning. After some serious thought, I think this theory is vastly over-simplified. It certainly doesn't make sense to me and I doubt it can be applied to most people working in creative fields. Why do those of us in the fiber arts love to work with fiber? I can't speak for you, but I love it because it taps into problem solving, specialized knowledge and skill sets that, when combined, result in a tangible end product. It all starts with planning. Doesn't everything? For me, this stage of thinking about a project is highly engaging. I can--and do--spend days with a challenge project or two (or more) that lurk just below consciousness in my mind. This type of problem solving triggers active mind exercises that follow 'if this, then that' Boolean-like pathways. Periodically, a potential solution emerges. Eventually, it's one that works. The planning almost always focuses on an end project and over time, it may morph many times. Process is essential to doing and there are times I am actively and enthusiastically engaged. What else is process than making samples? I like making them, just not exclusively. Samples are often stage two in the steps toward a project, but many are loosely targeted to some nebulous, unplanned future project. Another example of process is working out problems of a smaller scale. These I assign to the evening when my creative energy is at its lowest ebb. As I've confessed, I'm still trying to master the art of knitting socks, so lately I've had socks on my needles. Purely process. Although I love working out the kinks and thinking through the obstacles, I can find it a slog to the end if it's a pain to find a place to use my dye pot--or highly repetitious. Yes, I'm easily bored. That shrug I shared with you recently is a good example. Nope. I'm no process person. Without a project, there is no goal. And I am definitely a goal-oriented person. I love my libraries of samples. These are my idea banks, but they are strictly a means to an end. I want a tangible outcome. And that suggests I'm a project person. But I don't think I am. After careful consideration, I think the "process vs. project" theory is far too restrictive for creative endeavors of all sorts, including fiber arts. L. Thirties small square top, 1930s. R. Bright squares. Kaffe Fasset, 2014. I remember the times when my mother, aunt and grandmother spent a day piecing leftover fabrics together and machine stitching the resulting tops to batting and a back cover. Beautiful art quilts they were not, but they provided warmth family beds. I made a quilt once, but I'm not a quilter. My one-off is a cathedral window memory quilt that was made of scraps from some of the many pieces of clothing I made for my children over the years. That's it. constructed and quilted by Pauline Smith. Blanket Statements, a current exhibition nearing the end of its run at the Michener Art Museum, Doylestown, Pa. is all about quilts. This wouldn't normally be a draw for me except that Kaffe Fasset is involved in the show and I've long been an admirer of his work, which are characterized by bold designs in rich vibrant colors. Fasset's distinctive style and bold colorways transcend a variety of media. I tend to associate him most with textiles--fabric, knitting, needlepoint, and patchwork--but that is too restrictive. His work extends beyond textiles to painting and mosaics. I went for Kaffe Fassett, but left with a deep appreciation of quilts both old and new. The show features 35 historical and contemporary quilts. Fifteen of the new quilts were designed by Fasset with inspiration from an equal number of historical quilts dating from 1780 to 1949 from the collection of the Quilt Museum and Gallery, York, UK. In this exhibit, there is no question of confusion between Fasset's designs and their historical inspirations, which are displayed either below or adjacent to them. The two quilts at top right show kinship, but Bright Squares, which was constructed by Liza Prior Lucy and quilted by Judy Irish, is unmistakably contemporary. My favorite quilt was Red Squares (at right). Designed by Fasset and constructed and quilted by Pauline Smith in 2014, it is bold not only in color, but in its use of fabric motifs. Most historical quilts are based on small pieces of fabrics where any pattern, if not already small, is reduced beyond recognition. In this case, the fabrics large floral motifs are central to the design and emphasized by the quilting. Quite dramatic. Canadian Red Cross quilt, 1939-1945. One solitary quilt was more reminiscent of the quilts my grandmother made from fabric scraps and a stark reminder that not everyone had beautiful fabric to work with. They were made from what was at hand. In this case, plain, checked and striped suiting fabric from sample books. The quilt on display is a Canadian Red Cross quilt, 1939 to 1945 and its three layers tied together with wool. The exhibition ends soon. Get there if you can. If you can't, consider purchasing the museum's booklet filled with photos of the quilts. In the meantime, here are two more Fasset quilts I liked. L. Earthly Herringbone, 2014. (partial) Designed by Kaffe Fasset, interpreted and constructed by Judy Baldwin, quilted by Judy Irish. R. Diamond Jubilee, 2014. Designed by Kaffe Fasset, constructed and quilted by Pauline Smith. What my mind envisions in a project is not always how it turns out. A recent project combined all the wrong elements to result in a truly ugly item. I had seen the pattern for a cute shrug pattern that was cleverly constructed. It was knit in one piece and sewn together somewhat like a fortune cookie. I couldn't wrap my head around 'how,' so I bought the pattern with plans to knit it up with some yarn I had in my stash, Araucania Ruca. Made from sugar cane, the yarn is soft with a sheen reminiscent of silk. Nice to touch. Bad choice. Note color variation and extreme sag. I knit and knit and knit....It was a boring project IMHO....ribs and short rows that seemed to go on forever along a long curved rectangle. I found it a slog, but still looked forward to sewing it together. But when I did, I hated it. I still hate it. It is ugly. And it is all my fault. The pattern was not the problem. The problem was me. I introduced too many variables and ruined it. Oh, there was another problem and, again, it was all my doing. My tension from beginning to end varied. (I confess: I was bored and put the project down far too often.) The variation in tension is distinctly visible in the photo. Taken together, the combination of tension difference, yarn with no memory and color variation and does not a pretty picture make. 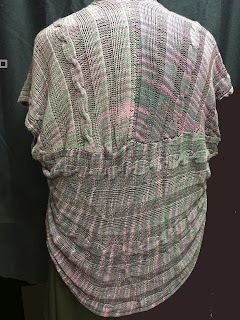 This shrug is only the last in a long line of misshapen and/or misfitting garments that have failed to live up to my expectations over the years. But as I see it, there is really only one absolute solution and that is to be safe. I can buy a pattern and knit it in the recommended yarn to be fairly confident of the outcome. But what's the fun in that? Where's the adventure? So, I can be safe or I can try different things. This means that I have to be willing to throw away the mishaps--no donations to charity!--and learn from them. If time is the only factor, I should have a trunk full of lessons learned and make nothing but perfect projects, but it doesn't work quite that way, does it? I intend to keep trying new ways. I expect to throw some of them in the dustbin but some will be mistakes that lead me in new directions. Working with fiber is most rewarding when I can insert something of myself into the process. Whatever you call it the result--personal expression, originality or creativity--I can call it mine.